“Peter and the Starcatcher,” and Vote Yes on 3! With Lindsay Eagle, Robert Benton Orzalli, Michael John Ciszewski, Lauren Elias, Joey Cletis Pelletier, Molly Kimmerling, Claire Koenig and Bob Mussett. Picture by Tim Gurczak. 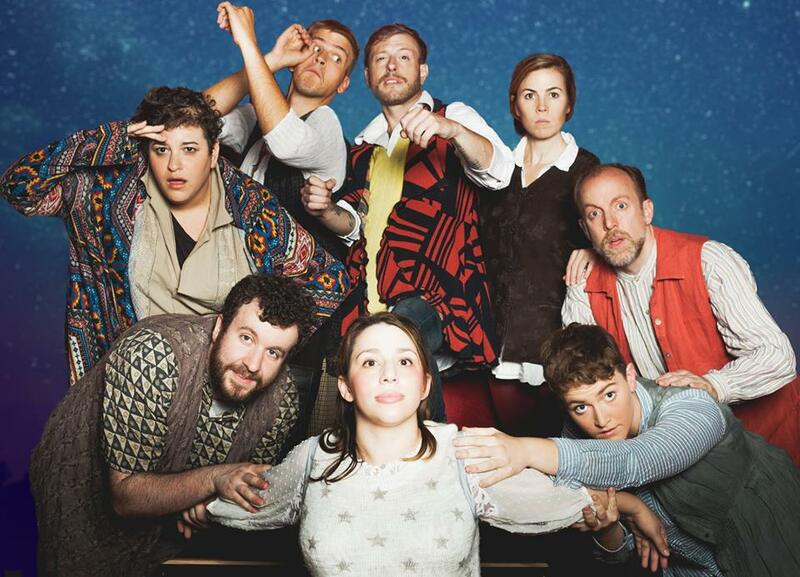 (Boston, MA) Peter and the Starcatcher is a reimagined origin story for Peter Pan. Before he was the boy who wouldn’t grow up, Peter was an orphan with no name, no friends, and no home. Robbed of their childhoods, Peter and his fellow lost boys are sold to the treacherous, orphan-hating captain of The Neverland, Bill Slank. Slank has stolen Queen Victoria’s treasure trunk and left a decoy in its place on HMS The Wasp. Also aboard The Neverland is Molly Aster, daughter of The Wasp’s captain, righteous and patriotic Lord Leonard Aster. The Asters are revealed to be more than imperial apologists when a band of pirates capture The Wasp and sail for Neverland’s stolen treasure. The adventure lands everyone on Mollusk Island, inhabited by a tribe of English-hating Italian chefs, allowing Peter to discover who he truly is and where he belongs. Posted in Musicals and Opera	| Tagged 2018, Bob Mussett, Boston, Claire Koenig, Diana Lu, Disney, First Church of Boston, Hub Theatre Company of Boston, Joey Cletis Pelletier, Lauren Elias, Lindsay Eagle, MA, Michael John Ciszewski, Molly Kimmerling, November, Peter and the Starcatcher, Peter Pan, Rick Elice, Robert Benton Orzalli, Sarah Gazdowicz, The Neverland, Yes on 3!